I know, I know, my last post featured a braised chicken dish; time to move on, right? Well, I just wasn't ready, especially when I spied beautiful locally-raised chickens at the market yesterday. Not "coqs" (roosters) perhaps, but still, fine chickens I couldn't help but envision bathed in the winey, shroomy, bacony braise that is Coq au Vin. 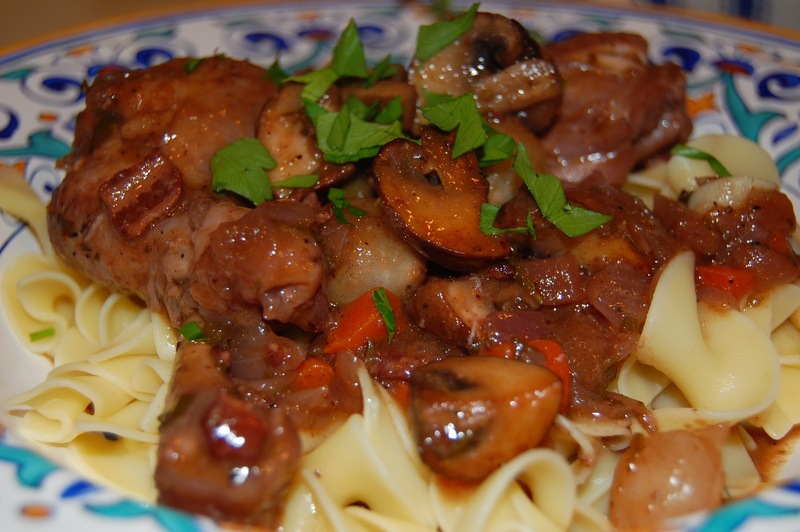 Coq au Vin holds a special place in my heart; it introduced the world of French cooking to a highly impressionable, if somewhat provincial, twelve year-old. Since I grew up in a small, restaurant-deficient town an hour outside of Boston, I coveted special occasions when my family ventured to the city to eat at the now defunct Maison Robert. I recall the thrill of opening the menu and poring over exotic dishes proffered in the mother tongue. Coq au vin, mousse au chocolat; how I loved the ring of those words in my head, though they never sounded quite as mellifluous when I self-consciously pronounced them to the waiter. How could I not be tongue-tied? I looked around and saw Real French People. 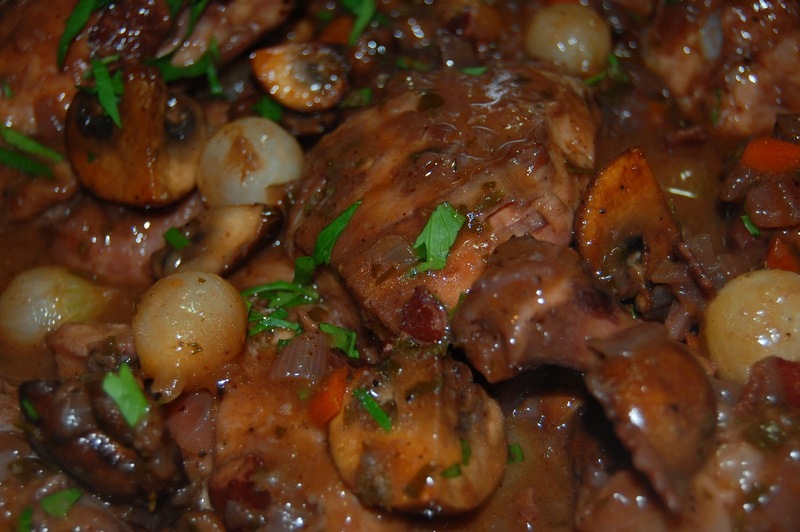 Maison Robert, a bastion of French cuisine in its day, went out of business decades later when its owner opted to retire - but the classic standbys it featured, such as Coq au Vin, remain timeless. Since I still had Molly Stevens' All About Braising within arm's reach from my last cooking extravaganza, I looked to her for a well-tested recipe and she didn't disappoint. While there are many "quickie" recipes out there employing a variety of shortcuts, they just make me sad. In one, chicken breasts are cooked all the way through, set aside, and a wine sauce is created on the fly with the bits left in the pan. This may taste okay but it's not the Coq that inspired me to go to culinary school. At the other end of the spectrum are historic recipes which require marinating a rooster for days and thickening the sauce with its blood. I think the following version is the best compromise: relatively quick but still respectful of the braising tradition that made this dish a classic. For adaptations I made to the recipe, see notes below. 1. The bacon: Place the diced bacon in a cold, large Dutch oven or other heavy lidded braising pot (7 quart works well), set over medium heat, and cook the bacon, stirring often with a slotted spoon, until well browned and crisp on the the outside but with some softness remaining inside, 12 to 15 minutes. Transfer the bacon to a plate lined with paper towels. Set the pot with the rendered bacon fat aside off the heat. 2. Heat the oven to 325 degrees. 3. Dredging the chicken: Rinse the chicken with cool water and pat dry with paper towels. Season on all sides with salt and pepper. Spread the flour in a wide shallow dish, and dredge half the chicken pieces one at a time, placing each one in the flour, turning to coat both sides, and then lifting and patting lightly to shake off any excess. 4. 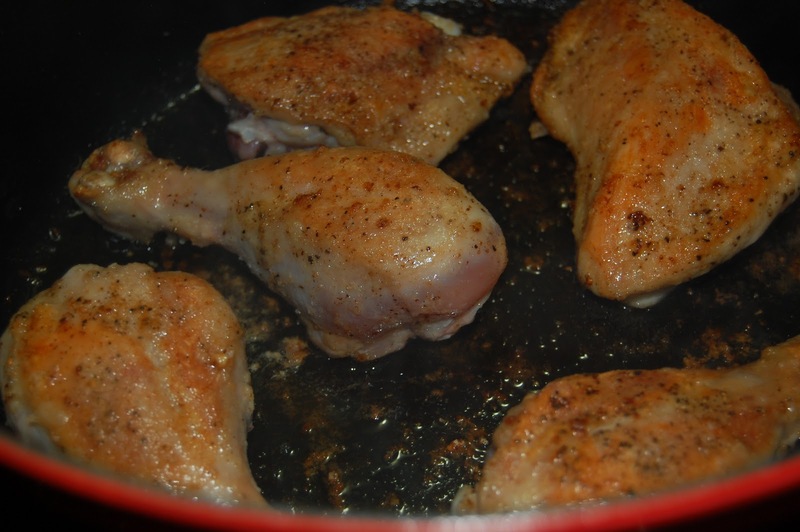 Browning the chicken: Add 1 tablespoon butter to the rendered bacon fat in the pot and place over medium-high heat. When the butter has melted, ease in the dredged pieces of chicken, skin side down, without crowding. Sear on both sides, turning once with tongs, until a deep golden brown crust forms, 7 to 10 minutes total. Transfer the chicken to a large platter to catch juices. Dredge the remaining chicken pieces and discard the flour. Add another 1 tablespoon butter to the pot. Sear the chicken pieces as you did the first batch, turning once with tongs, until golden. 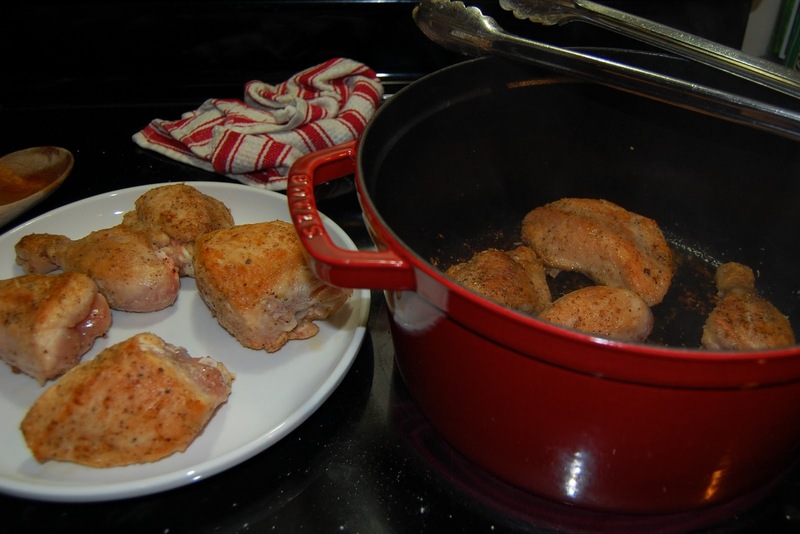 The second batch of chicken pieces may brown faster; lower the heat a bit if the skin begins to burn at all. A thick ruddy crust will have formed on the bottom of the pot that will later contribute a great depth of flavor to the sauce. Transfer chicken to the platter, and pour off the fat from the pot without discarding the tasty browned bits. Return the pot to medium heat. 5. 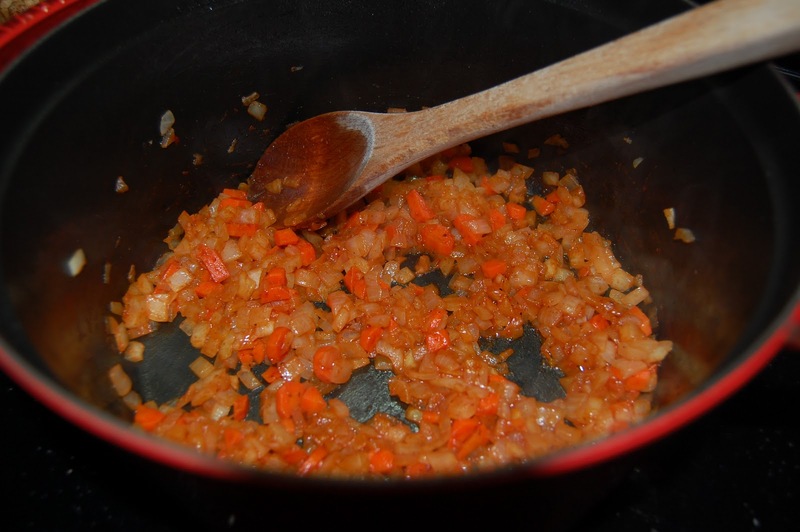 The aromatics and braising liquid: Add the remaining tablespoon of butter to the pot and melt it over medium heat. Add the onion and carrot, and toss to coat the vegetables in the butter. Saute, stirring once or twice with a wooden spoon, until the vegetables are beginning to soften and are flecked with brown, about 5 minutes. 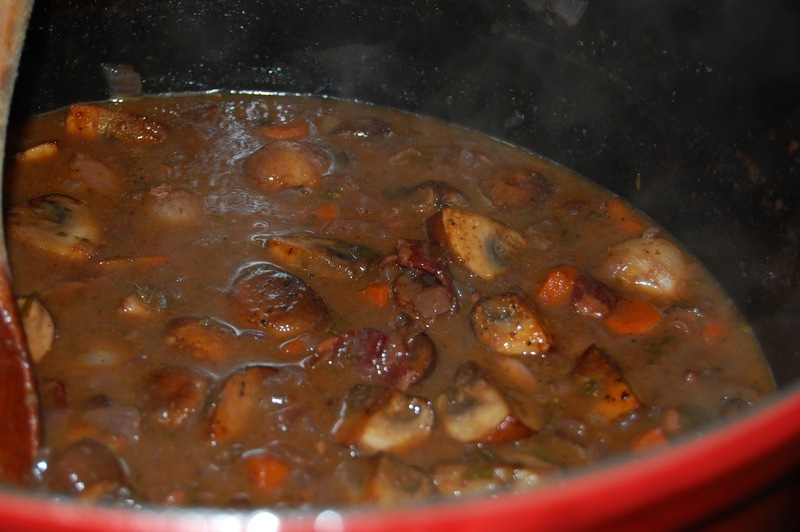 The browned crust on the bottom of the pot will continue to cook and may soften from the vegetable juices released into the pot. Add the tomato paste and stir to smear the paste through the vegetables. 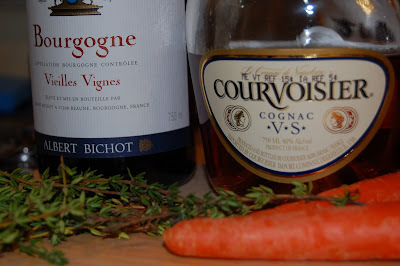 Add the Cognac and bring to a boil to deglaze, scraping the pot with a wooden spoon to dislodge the precious crust. Simmer, stirring a few times, until the liquid is almost gone. 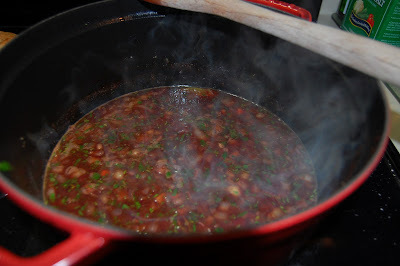 Raise the heat to high, add the red wine, garlic, bay leaf, thyme, and parsley, and bring to a boil. Lower the heat to medium-high and simmer rapidly until the wine reduces by about half, about 15 minutes. Stir in the reserved bacon and the stock, and bring to a boil. Using a ladle, scoop out about 1/2 cup of braising liquid and set aside for later cooking the pearl onions. 6. The braise: Add the chicken pieces to the pot in this order: place the legs, thighs, and wings, and the wing tips, back neck, heart, and gizzard (if using) in the pot first, then put the breast pieces on top of them, skin side down. (Keeping the breast pieces on top protects them from overcooking and drying out.) Pour in any juices that collected as the chicken sat, and bring to a simmer. Cover the chicken with parchment paper, pressing down so that the paper nearly touches the chicken and extends over the sides of the pot by about an inch. Cover with the lid, and place on a rack in the lower third of the oven to braise. After 15 minutes, turn the breast pieces over with tongs. At the same time, check that the liquid is simmering quietly. If not, lower the oven temperature by 10 or 15 degrees. Continue braising gently for another 45 to 60 minutes, or until the breasts and dark meat are fork-tender. Heat 1 tablespoon of the butter in a large skillet over medium heat. 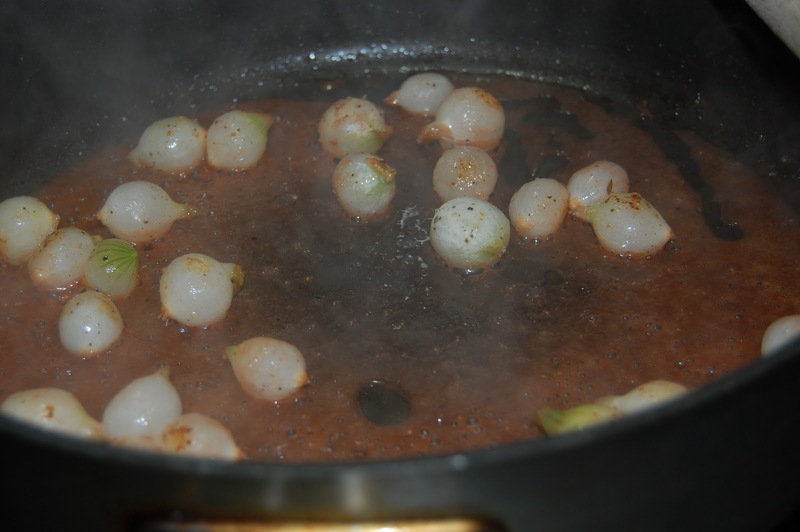 Add the blanched onions (or still-frozen onions) and saute, stirring and shaking frequently until tinged with brown, 3 to 4 minutes. Season with salt and pepper, add the reserved 1/2 cup of braising liquid, cover and simmer, shaking the pan frequently, until the onions are tender when pierced with the tip of a knife, about 12 minutes (or 3 or 4 if using frozen). 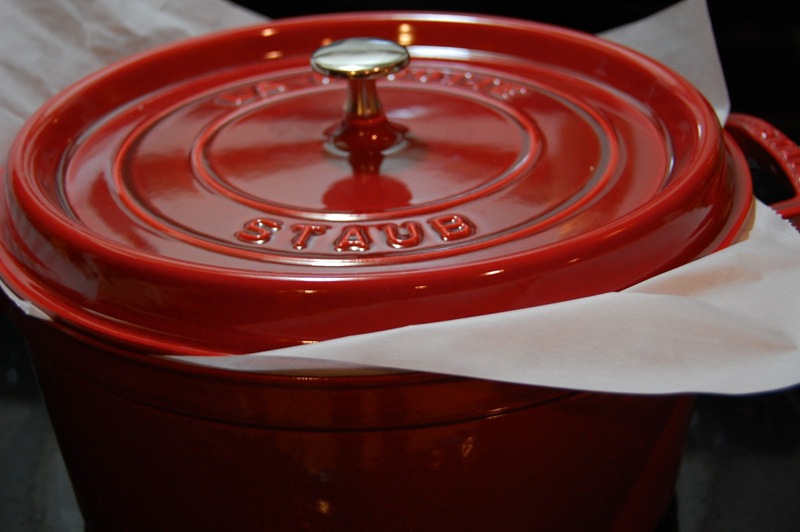 Remove the lid, increase the heat to medium-high, and boil to reduce the liquid to a glaze. Transfer the onions and liquid to a small bowl, scraping the pan with a rubber spatula as best you can. Return the pan to medium-high heat and add the remaining 1 1/2 tablespoons of butter. 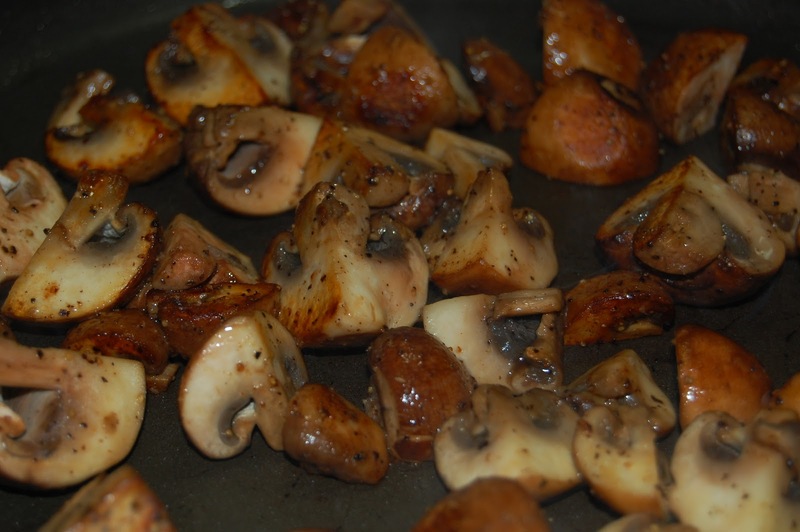 When the butter stops foaming, add the mushrooms, season with salt and pepper, and saute briskly. 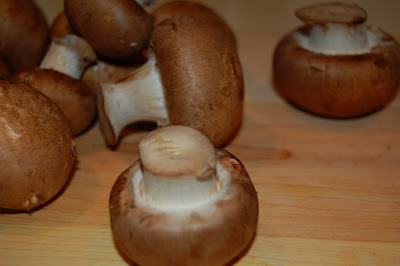 The mushrooms may release a lot of liquid at first. 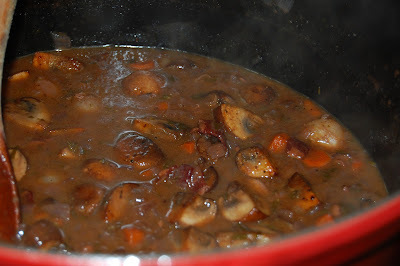 Continue to saute, stirring occasionally, until the liquid has evaporated and the mushrooms develop an attractive, chestnut brown sear, about 10 minutes. Remove from the heat and return the onions and liquid to the skillet. Set aside. 8. The finish: When the chicken is fork-tender and pulling away from the bone, transfer the breast, thigh, leg and wing pieces to a deep platter or serving dish (discard the wind tips, back, neck, heart and gizzard), and cover loosely with foil to keep warm. Let the braising liquid settle for a moment and then, with a wide spoon, skim off as much surface fat as you can without being overly fastidious. Place the pot over high heat and bring the juices to a boil. Reduce the juices until thickened to the consistency of a vinaigrette, about 10 minutes. Remove and discard the bay leaves, if you like. Lower the heat, add the reserved onion-mushroom garnish, and heat through, about 4 minutes more. Spoon the sauce over the chicken pieces, sprinkle with the chopped parsley, and serve. * As I was typing this recipe I thought, damn, this recipe is long! I was tempted to pare it down, but then, Molly Stevens is an award-winning cookbook author; who am I to question? So she doesn't skimp on details, but don't be put off by its length. You'll see that much of the recipe elaborates on techniques you're probably familiar with. * I forgot to reserve the back, neck, etc., after cutting up the chicken and decided not to dig them out of the trash. Everything was fine without them. 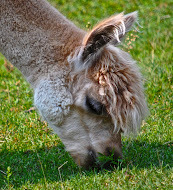 * I used as little butter as I could get away with, although this is definitely not spa cuisine. 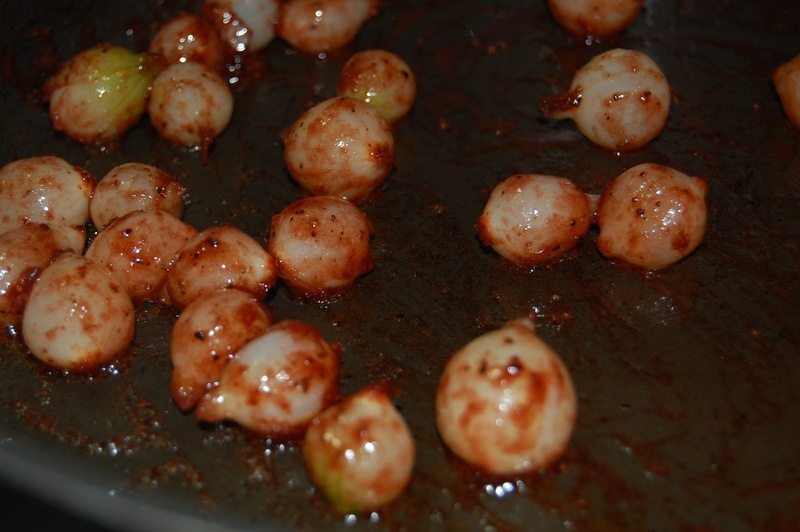 * Although I followed instructions and braised the pearl onions in braising liquid separately, I don't typically do this and wouldn't do it again. I would simply saute the onions until browned and add them to the pot with the mushrooms. * Unfortunately, I didn't have slab bacon so I used regular sliced bacon, cut into 1/4 inch pieces; I also skinned the chicken parts (and was glad I did; braised chicken skin turns me off and the dish was very moist without it) and added an extra carrot and an extra clove of garlic. Well done, honey, this came out great! And a fine trial run for your new braising pot. hi nice post looks good!!!! Oh là là, wow Tina, this looks great and I can make it even with my restricted allergies diet! Thanks for noting your changes, which look like they make the recipe even easier. Can't wait to try!! OMG. Made this yesterday. Another winner Tina, Thank YOU. I MUST get Molly Steven's book. !!! So glad you had fun with this one and you have something new you can eat on your diet.